Now that you have installed your HD antenna, if you missed that one be sure to checkout my article on How to watch local TV channels for free!, you need to setup your TV for receiving Over The Air channels. This varies from TV to TV, but the process is similar for all televisions. First, locate the Setup or Menu button on your TV’s remote control. Press the button to bring up your television’s Setup menu. Next, set your Input to either “Antenna” or “Air” as opposed to “Cable”. This option might be on the Setup menu main page or it might be hidden under another section like Channels, TV, or Broadcast. The second step is to run a Channel Search or Auto Program. This will make your TV look for all the channels that it can get over your new antenna and save them for easy ‘flipping’ in the future. Again, this feature is accessed through your TV’s Setup menu. While this is running you will probably see your TV list off the channels as it finds them. Check out my video below to watch just how easy this is! Go to www.tvfool.com and punch in your address. This will create a list of channels in your area, ordered by the tower’s distance from your house. Under “Netwk” is the channel name and under “(Virt)” is the channel number you will enter on your TV. Go to www.zap2it.com and enter your ZIP code. Then, under “Choose Your Provider” select “Local Broadcast (Antenna)”. This will create a guide or schedule for the channels in your area. How to watch local TV channels for free! One of the first questions asked by new cord cutters is “What about local channels?” “How can I watch my prime time shows on the major networks?”. All of the major networks like NBC, CBS, ABC, FOX, PBS and CW are all broadcast over the air by your local television affiliates which can be grabbed out of the air and displayed on your television for FREE using an HD antenna. This is the same way people watched TV back before the time of cable television, using good old “rabbit ears”. As technology has evolved we have switch from using rabbit ears getting staticy analog TV to HD antennas getting high quality HDTV. In addition to purchasing an HD antenna, you must make sure your television is HDTV compatible. If you’ve bought your TV within the last 10 years then its safe to say its HDTV compatible. If its a flat screen, you are probably good to go. If you are unsure, look for an “HDTV” logo on your tv set. Now that we’ve got that out of the way, lets talk antennas. There are many different types of HD antennas in today’s market, below are the two most popular and simple to install in my opinion. The quick and easy HD antenna that can be added to each of your TV’s is the Mohu Leaf 30 Paper-Thin Antenna. This thing is a flat piece of plastic, about this size of a sheet of paper, that hangs behind, above, on the back of or next to your TV. It does not need any power, so you don’t have to plug it into any wall outlets. All you do is hang it up and connect the 10 foot coax cable to the back of your television. This antenna has a 30 mile range, so as long as you live in a reasonably sized town, you should be able to rope in all of the major network channels. The more advanced HD antenna that can supply all the TVs in your house is the Winegard Freevision HDTV Antenna. 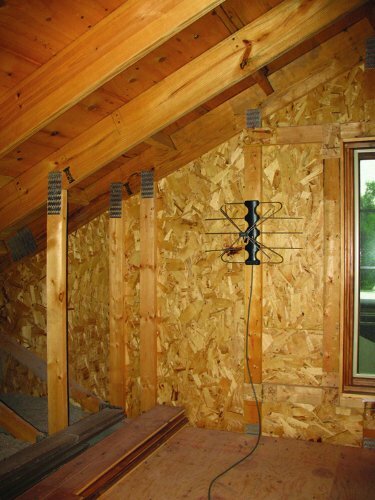 This is a large wire antenna that can be mounted in your attic or outside your house on a pole. It also does not need any power, so you don’t have to plug it into any wall outlets. All you do is mount it up and connect the provided coax cable into your house’s existing coax network. The best way to do this is to find where your existing coax comes together at a splitter, usually this is in your basement or inside a cable box on the side of your house, and connect the antenna to the input side of the splitter. This will surely require some investigating and troubleshooting, but is totally doable with a little patients. This antenna also has a 30 mile range, but since it can be mounted higher up (in your attic/on your house) it can pick up channels that option 1 might not be able to depending on where your house is located. So there you have it. My top two ways that you can get local TV channels, for free, in your own home. As always, please don’t hesitate to comment or ask any questions you have below.